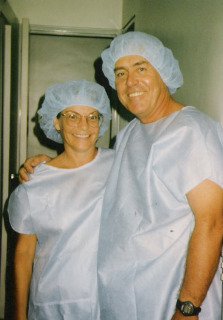 Healthcare overseas..want to save a ton of money on a surgical procedure?...Consider going abroad...seriously. Up to 500,000 Americans went overseas last year...to have a operation done. Why? It is cheaper than having it done in the US...that is why. There is a whole new industry spawned by the soaring cost of healthcare here in the US. They call it medical tourism...healthcare combined with vacations. We have been brainwashed into thinking that healthcare is only "good" here in the US.Folks, I love living in the United States...but some Americans think that the rest of the world is backward. If your only overseas experience is getting off the cruise ship in Jamaica I caution you not to put the rest of the world in the same basket. European and Asian economies are stronger than ours. According to the World Health Organization Amercia ranks 37th in the world for overall healthcare...37th not 1st. They can afford to go anywhere they choose for a surgical procedure. They are not exactly flocking to the US for hip replacements. If the doctor does not have a US diploma on his or her wall, and is not Caucasian, he or she is no good, and you will receive substandard care. Do any of these mtyhs, and they are myths, apply to you? 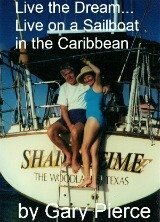 In 1996 , while we visiting Venezuela in our sailboat, we had laser surgery done on our eyes in Caracas. Our doctor, Dr Saurez, had performed the operation 8,000 times. The procedure was not yet approved in the states. 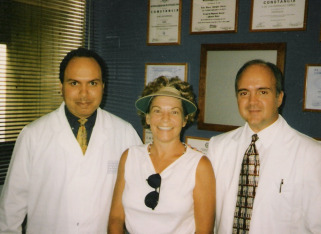 US doctors were in Caracas...while we were there...to undergo training by Dr Saurez. The surgery took about a minute...have not needed glasses since...no problems. Total cost $1,150 US...$350 an eye...the surgeons fee, $50. Julie had 2 eyes done, me only one the doctor said the other eye did not need it. That is Dr. Saurez on the right. He graduated from medical school at Louisiana State University in Baton Rouge. Do not be surprised at the fact he is US educated. Many of the doctors that we ran into in the islands went to school in the US, but wanted to return home to enjoy the more peaceful lifestyle. Many countries even pay for US med school if the doctor agrees to practice for a period of time in the home country. That is a win-win, good for the locals, they have a doctor as good as any in the US...and pay a fraction of the cost. We bet our eyesight on healthcare overseas being excellent and it is. If you are faced with a procedure, and want to combine a vacation with the surgery...take a look at going overseas.